As a CNA, it’s your responsibility to keep the track of patients’ condition by counting and recording the radial pulse. Any serious problem can be detected by tracing changes in patients’ heart rhythm. By constantly monitoring the radial pulse of the clients, you can help them in providing life-saving care. This article will assist you to learn this skill from exam’s point of view. Read it! Using the procedure discussed in “Hand Washing Skills”, rinse your hands. Get hold of all required supplies. Greet the patient. Clarify him that you are going to count and record his radial pulse. Ask the client to extend left or right arm (as per the patient’s ease) and then, hold his hand. In order to locate the radial artery, put your middle and index finger on the hollow portion of his wrist. 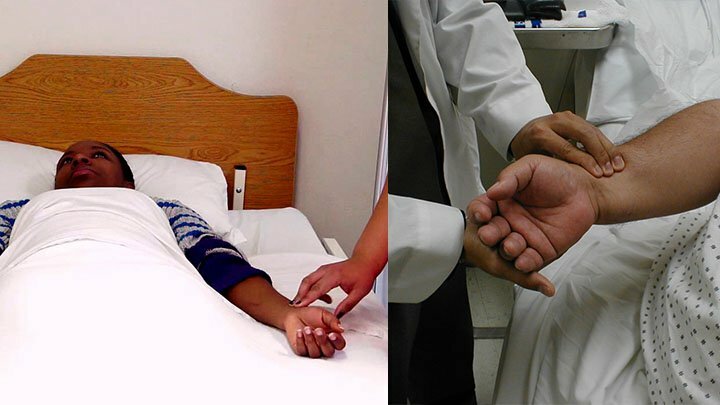 With the help of your fingertips, apply pressure on patient’s wrist till you feel his pulse. Count the number of heart beats in 30 seconds (continue counting for one minute, if sufferer’s heart rate is irregular). To obtain the client’s pulse, multiply the number with 2. Record the result in the client’s medical chart as per directions. At last, wash your hands again in order to prevent spreading of infection. Count for thirty seconds for one minute. Don’t forget to multiply the number of counts by 2. Remember, the pulse rate of adults should be 60-80 per minute. Physically fit or patients in resting phase have a lower radial pulse. Medications, drugs, caffeine, stress, blood loss, fever and exercise can increase the heart beat. Therefore, count properly to trace the problem. What Does an Examiner Observe When You Perform Count and Record the Radial Pulse? Whether you have completed the task that requires to be performed in the beginning? Tip- Always start the procedure with rinsing your hands in an apt way. Wether you have positioned the client in a proper way? Tip- Let the patient to lay or sit in that position in which he/she feels comfortable. Whether you have placed your fingers on the radial artery? Tip- To locate the radial artery of the patient put your middle and index finger on the hollow portion of his wrist. First you find the radial artery, and then examiner finds pulse on opposite wrist. For how long you have recorded the pulse? Tip- Count the number of heart beats for 30 seconds. Extend counting for 60 seconds, in case of any irregularity. If you have multiplied the counted pulse by 2? Tip- Always multiplies the result with 2 to get pulse. If your evaluation of the pulse rate is within +2 or – 2 beats per 60 seconds of examiner’s evaluation? Tip- Your pulse rate count of the patient should be within +2 or – 2 beats per 60 seconds of examiner’s evaluation. Whether you have performed the completion task? Tip- Perform hand washing after recording a radial pulse. The radial pulse of indicates several important aspects of a patient’s health. Therefore, it’s imperative to measure and record it appropriately. In most of the health care centers, the task of measuring pulse rate is regarded as a division of vital parameters assignment. During skills test, you are provided with clear instructions to count the pulse for 30 seconds, and then multiply by 2. When you actually become a CNA, you can count for 15 seconds and multiply by 4. But, for skills test you should not use 15 seconds method. The correct number of beats (which differs from patient to patient) should be in your mind, when you use 15 second method to count the pulse. In case, if you are counting the pulse rate of an unfamiliar patient and getting a strange reading, count again for one minute. If the results are again strange, instantly inform the in-charge nurse. The in-charge nurse will count and record at her own. While preparing patient’s medical chart at the end of your work shift, ensure that you have mentioned the aberrations in his pulse and that the nurse have been notified about it. Measuring and recording the client’s pulse rate is tedious and tempting, despite this you must not skip this important task. Many times due to hectic schedule, a nurse aide doesn’t get time to perform vital rounds till the end of the shift. Skipping this necessary duty is completely against the work ethics. The next CNA, who is going to take over the duty after you complete your shift, will not know that something wrong has happened with the patient. In fact, the next person will simply think that the previous nurse aide has already done his job and now, there is no need to take vital rounds! If you are measuring the vital parameters of the same client repeatedly, note down the important changes that need immediate attention in the medical chart. Remember as a certified nursing assistant, patient’s safety is your first priority, so be careful in rendering your duties. Watch the below given video to learn the correct procedure of counting and recording the radial pulse.